Product Description : Designed to fuel body with required calories per day. Purely natural and does not have any side effects. A 100% Vegetarian Supplement.Visible results within just three weeks of proper usage. 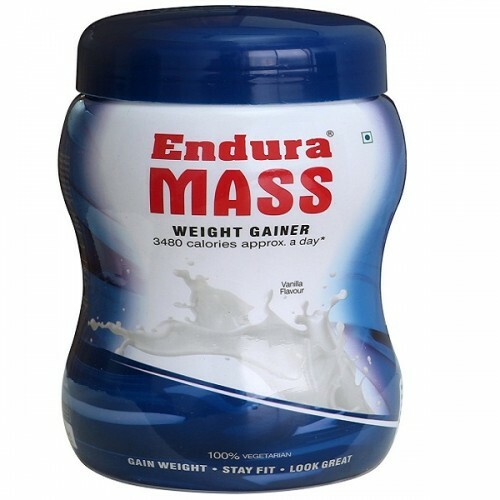 Suggested Use : Add 10-30 gms (2-3 teaspoons) Endura Mass in a glass or milk or juice. Mix well. Take this drink one to three times a day. Ingredients : Contains Whole Milk, Skimmed Milk, Maltos Dextrine, Soy proteins, Sucrose, Minerals, Vitamins, Approved Flavours and Preservatives.